October 5, 1979. This is when women for the very last time were allowed to watch a derby game in Iran. Since then they've been banned from attending stadiums for the same games that men attend. 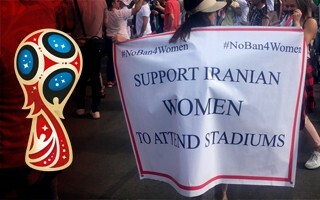 The ban is informal, imprecise and selective as female supporters from other countries have been accepted inside, while Iranian women being kept out at the same time. In fact, they often end up arrested and penalised when trying to sneak in dressed up as men. Taking this into account, yesterday was a minor breakthrough. First time in years the public screening of Iran-Spain game at the World Cup was attended by both men and women. And where? At the monumental Azadi Stadium, too! It still doesn't lift the ban for regular football fixtures, but is a step in the right direction. Is it the outcome of international pressure? After all, there's been room for Iranian women in the World Cup spotlight. While some 20,000 Iranians are visiting Russia, they're allowed to sit together regardless of their gender. Ongoing petition to lift the ban is gaining momentum along the way, while public awereness of women's issues in Iran is growing rapidly. In part thanks to actual Iranian men and women in Russia, who aren't afraid of speaking out, be it to journalists or fellow fans from other countries. That said, yesterday a sad incident occured in Kazan, where security officials were refusing entry to this banner campaigning for women's rights. It's a faux pas at best, because the banner was approved by FIFA (interpreted as social rather than political) and prior to the Spain game it was allowed inside the Saint Petersburg stadium. In contrary to Tehran's "Happy" night, Iranian activists in Kazan had hard time with security forces in Kazan because of the banner they had premission from FIFA for it and showed it during Iran's first match.